While famous images such as the Mona Lisa are commonly recalled when we think of Renaissance art, there were a lot of interesting artists that didn't quite get superstar status but nevertheless produced some stunning images. Among my favourite of the Renaissance painters was Jacopo (Comin Robusti) Tintoretto. Many art historians dub him 'The Last of the Great Renaissance Masters' with the vibrant colours and energy of his work setting the scene for the Baroque style which was to follow. Despite the overtly religious subject matter of most of his work, one particular piece transcends beyond being a rehash of The Last Supper, and shows a much later, more obscure event - and depicts it in a way that makes it read just as much like a page from a history book than a slice of religious lore. The Miracle of Saint Mark Rescuing a Slave is a fascinating image. Painted in 1548 for the Scuola Grande di San Marco, a Venetian school dedicated to St. Mark, it now resides at the Gallerie Dell'Academia in Venice. 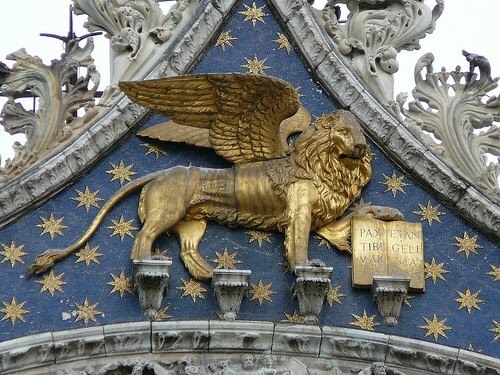 Saint Mark, of Gospel fame was catapulted to Patron status of Venice in 828 CE, when some daring Venetian merchants stole what is believed to be the remnants of his body (minus the head) from its original resting place in Alexandria, Egypt. 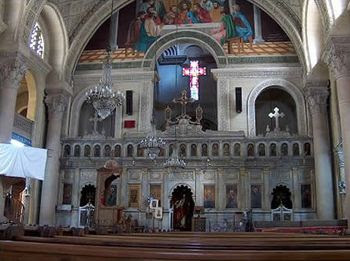 The head is stated to still be in Alexandria - at Saint Marks's Coptic Church, and attracts many pilgrims to this day. Somewhere in there is St Mark's head apparently! "..his lord commanded that his eyes should be put out; and the other servants that were ready to do the lord's will made ready sharp brochettes(skewers) of iron, and enforced them with all their power and might not do it. Then commanded the lord to hew off his thighs with axes, but anon the iron was as soft as molten lead. Then commanded he to break his teeth with iron hammers, but the iron thereof was so soft that they could do him no harm." Although the corporeal presence of Saint Mark was never mentioned in the legend, Tintoretto has taken the more dramatic route of illustrating Saint Mark physically descending from the heavens. This depiction actually caused a few frowns at the time the painting was initially unveiled, with the back turned, falling saint not being seen as a positive image. This type of energetic composition was a Tintoretto trademark, with this particular scene placing the viewer within the throng observing the miracle. In true Renaissance tradition, the artist again slips himself into the the midst of the spectacle. As demonstrated in van Eyck's Arnolfini Portrait and made famous by Michelangelo and Botticelli, by the end of the Renaissance, artists had become prominent enough to place themselves directly into the portrait. In this instance, to the left of the turbaned servants, we see a thoughtful Tintoretto looking on. A final interesting twist to the painting indicates another degree of creative license taken by the artist. The tale of the miracle as described in the Golden Legend indicates that this event occurred in France, when the servant returned to his master. 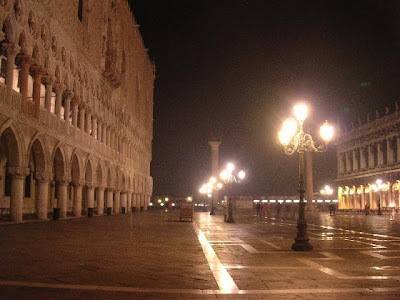 As with the physical appearance of Saint Mark, Tintoretto aims to show an even closer relationship of the patron saint to his city by suggesting that this event actually occurred in Venice. The architecture depicted and the characteristic paving is directly reminiscent of the Piazza San Marco in Venice. 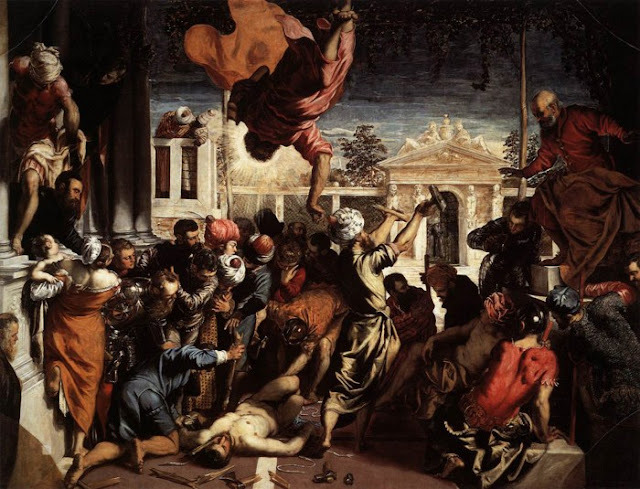 For some great reading on Tintoretto and his contemporaries in The Venetian School, check out the amazing Titian, Tintoretto, Veronese: Rivals in Renaissance Venice by David Rosand et al. It is a feast on the eyes and a wonderful insight into the rivalries that produced some of the most famous images in Western Art. Thanks for your detailed analysis of this painting. I'm planning to show the painting during a language lesson for the students to describe, and your explanation of the scene is very helpful.